It does not take much effort to wake a sleeping dragon or to put down your guard and let a new reptile slip into your castle. It can happen – just like that. The healer must figure out how to be a dragon-slayer, how to assist someone in either finally destroying her or his inner reptile or locking it down once again the dungeon of the inner shadow. The latter choice is not healing but often the path most taken. The sooner we stop the dragon from enflaming the mind, the better. Dragon fires on the brain eventually contaminate one’s entire being. I can tell when a person is being consumed by a dragon fire. It’s unmistakable. Dragon slaying requires the help of the person who has the dragon. We all have dragons and perhaps that is why we love myths about these wild, flying, fire-breathing creatures that hide in the underworld. They do reside in our underworld – indeed they do. And when we make allies of our dragons, they can make us feel invincible. Ironically, when we spot another’s dragons, we see clearly the destruction dragons create and the high emotional and physical price a person pays for housing them. I’ve encountered a dragon recently – and it’s made me wonder yet again, should I teach people to spot dragons and be dragon-slayers? Should I bring this skill into a Reflections class? Or should I just speak about it as part of my life? these two magical beings are enjoying getting to know each other. 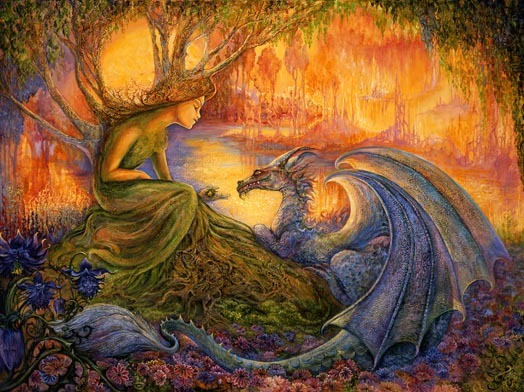 and in return the Dryad feels very safe with her scaly companion. She hopes that they will become friends forever, and that he will visit her often with tales of the world outside of her forest realm.